Collins Booksellers - A Time to Risk All by Clodagh Finn, 9780717175604. Buy this book online. 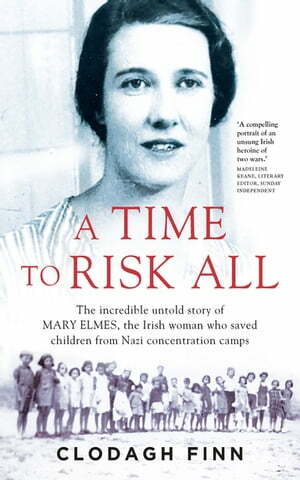 Clodagh Finn has travelled throughout Europe to piece together the story of this remarkable, unknown Irish woman, meeting many of those children Mary Elmes saved. Here, in a book packed with courage, heroism, adventure and tragedy, her story is finally remembered. The children called her ‘Miss Mary’, and they remember her kindness still. She gave them food and shelter and later risked her life to help them escape the convoys bound for Auschwitz. Turning her back on a brilliant academic career, Mary Elmes ventured into a war zone to help children in the Spanish Civil War. In 1939, she fled Franco’s forces but continued to work with refugees in France when the Second World War broke out. In 1942, when it became evident that Jews were being deported to their deaths, she smuggled children to safety in the boot of her car. She was arrested and imprisoned by the Gestapo, but went straight back to work after her release. When the war was over, Mary married and settled down, never speaking about what she had done. Her story was forgotten. In A Time to Risk All her remarkable story is finally remembered as it should be.